Each year gifted string musicians under the age of 20 compete in the Stulberg International String Competition for a chance to win performance opportunities and cash prizes. 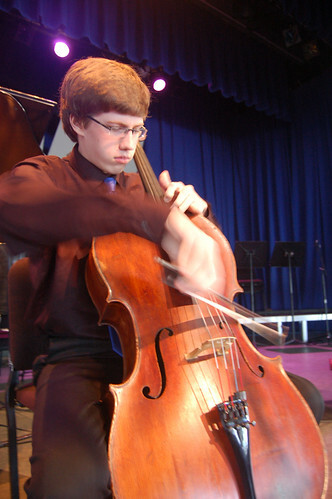 The 2011 Gold Medal winner was From the Top alum Austin Huntington (Show 239 in Ocean City, NJ), and he received $5,000 and an orchestral performance! Open to students of violin, viola, cello, or double bass who are under the age of 20 on January 1, 2012. The application postmark deadline is Friday, January 27, 2012, and you can find the application online. All submissions are reviewed by judges and 12 semifinalists will be selected by February 28. Semifinalists will perform a required Bach selection and an excerpt from a standard concerto and six finalists will continue to the final competition on May 19, 2012. Burdick-Thorne Gold Medal: $5,000 and a performance award to be announced. Silver Medal: $4,000 and a performance with the Western Michigan University Symphony Orchestra. Date to be announced. Pinehurst Bronze Medal: $3,000 and a performance award with the Kalamazoo Junior Symphony Orchestra. Date to be announced. Bach Award: $500 for best performance of solo Bach selection. Check out their website for more guidelines on repertoire selection and the required Bach piece.